A couple of us went to the Around 1914: Design for a New Age exhibit at the ROM. This is a small, elegant exhibit, with - naturally - lots of coverage on Morris and some beautiful items for display. It's on til next March! ~ The William Morris Society (UK) has announced details on their Joseph A. Dunlop Memorial Fellowship. You can read more here about what support they provide and how it can be applied for. 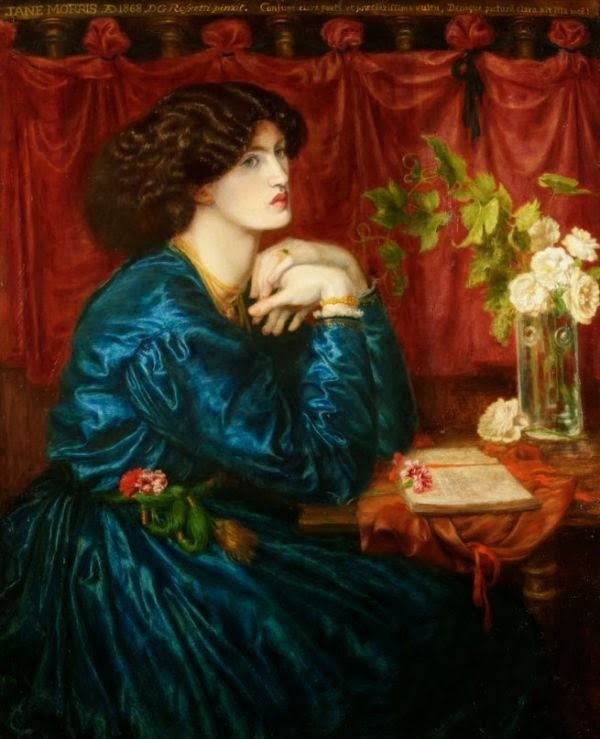 ~ Currently in Liverpool at the Lady Lever Gallery, the exhibit "Rossetti's Obsession: Images of Jane Morris" will travel to the William Morris Gallery in the autum. ~ Craft Ontario's new exhibit The Art of the Book runs from July 24 to September 13. The Art of the Book 2013 exhibition, organized and curated by the Canadian Bookbinders and Book Artists Guild (CBBAG), celebrates the potential of the book as an art object, and marks the CBBAG’s 30th anniversary. ~ The Tiffany exhibit at the Driehaus Museum in Chicago has been extended to January 4, 2015! WMSC member Karen Stanley attended this symposium in support of the ROM's new exhibit, which you can read more about here. And here's what Karen had to say! The Royal Ontario Museum hosted a symposium on April 10-11, 2014. The ROM first opened in 1914 during a time of change that was accelerated by industrialization and new modes of manufacture. The opening guest speaker was supposed to have been Margaret Macmillan but was unavailable. She was replaced by Rosalind Pepall, former Senior Curator of Decorative Art, the Montreal Museum of Fine Arts. Her keynote remarks were regarding Soaring Ambition and Design Before the War. She was a very good speaker and talked about the period as a time of bold experimentation and questioning regarding tradition that rejected conventional ornamentation and historical precedents. It laid the foundation of the movement to “modern” and a new concept called “industrial design”. The time was moving from Arts and Crafts to Art and Industry. The following day a series of international scholars spoke about designers and crafts people who were responding to the ideological and social challenges of the period through art, architecture and design. On April 11 Dr. Paul Stirton, Professor Bard Graduate Centre, Decorative Arts, Design History Material Culture, New York opened the morning session and spoke about the Arts and Crafts in the UK before the first World War. He spoke about crafts people such as Charles Robert Ashbee and Liberty’s of London. Dr. Pamela Robertson, Senior Curator and Professor of Mackitosh Studies The Hunterian, University of Glasgow followed. She spoke of Charles Rennie Mackintosh’s Architecture. At the time Mackintosh’s designs were considered controversial and innovative. Dr. Martin Eidelberg, Professor of Art History at Rutgers University gave a lecture on The Rise and Fall of Tiffany Studios. Etienne Tornier, Institut National de l’Histoire de l”Art, Paris gave a presentation of Art Nouveau, Siegfried Bing and America. Dr. Christian Witt-Dorring, Curator MAK Vienna and the Neue Galerie, New York gave an interactive presentation on Adolf Loos and Josef Hoffmann-Two ways to Modernism in Vienna 1900. The symposium ended with Peter Behrens, Painter, Architect, Industrial Designer, given by Dr. Stanford Anderson, Professor of History and Architecture at Massachusetts Institute of Technology. During the day participants were encouraged to view the ROM’s exhibition that accompanied the symposium. The ROM had pieces on display of Charles Robert Ashbee, Charles Rennie Mackintosh, Hosef Hoffman, Hacob and Josef Kohn, and Peter Behrens, to name a few. 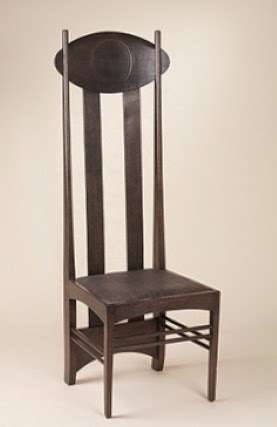 Image from the ROM's website: Chair designed by Charles Rennie Mackintosh (Scottish, 1868-1928) Probably made by Francis Smith and Son Oak, stained dark, horsehair fabric cover Glasgow, Scotland Designed c. 1898-1900, made c. 1898-1900. Finally... Doctor Who, Brad Pitt and Selfies make an Appearance on the Blog! I'm not going to let the blog lag like I did last month... so here we go with more news from Twitter and elsewhere. ~ Here's a stunning new offering from the Folio Society. It's a reproduction of Morris's The Odes of Horace. At $795.00 CDN, it's not in everyone's budget, but if it is - wow, what a gift for yourself or someone you really love! ~ Martin Stott (@divinity65) will be hosting his first William Morris Society (UK) event as president. The lecture by Bill Peterson is titled Virtual partner; Emery Walker & the Kelmscott Press. It's this Saturday at 2:15 p.m. in case you happen to be in London! And attention printing geeks! Our mother-ship organization has charmingly created these Albion Press "selfie" cards.They're available for purchase from the society. Visit their website, under "SHOP." ~ The Victorian Society's (@thevicsoc) new magazine issue is out now. It features Morris on the cover and Fiona MacCarthy on Morris and Ayla Lepine (@heartchitecture) on Watts & Co.The magazine gets sent out three times a year to members of the VS.
~ And it's not every day we mention Doctor Who and Brad Pitt on here, but - well, okay, we never have, but here it is: both actors have stepped up to support the fund-raising campaign to help restore the fire-damaged, Mackintosh-designed Glasgow School of Art by becoming trustees of the appeal. We here at WMSC knew Brad Pitt was a keen fan of architecture, and now we know that native Glaswegian Peter (Doctor Who) Capaldi studied at GSoA and has sent a delightful video message. Read the GSoA's blog post, complete with video and background on the actors and their interest in the building here. Keep sending in your news! Thanks everyone. We're just a bit behind here, but there's much to catch up on! ~ Kelmscott Manor unvelied its new website... right... here! ~ The National Portrait Gallery in London will hold an exhbition this fall: Anarchy & Beauty: William Morris and His Legacy, 1860 - 1960. This sounds unmissable. Any WMSC members going over? Let us know if you are! ~ On May 28, at the William Morris Gallery in Walthamstow, Darren Hayman recorded his arrangements of Morris's Chants for Socialists, with an amateur choir. Let's hope we get to hear the results soon! ~ Holly Cecil, as part of an undergraduate research project at the University of Victoria, B.C., has created four documentary shorts exploring Morris's life and work. Fantastic work, Holly! You can watch all four here! 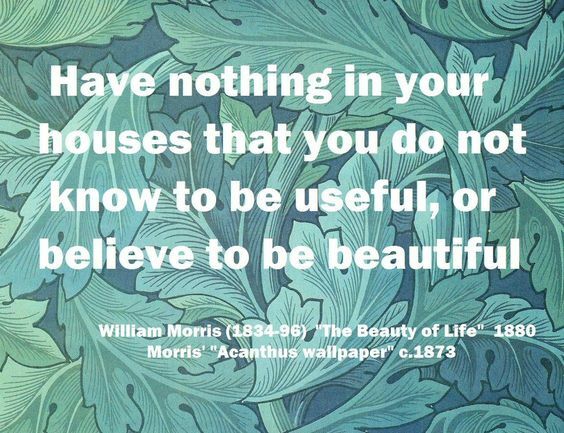 ~ Check out the University of Maryland's William Morris Collection of books and papers here. 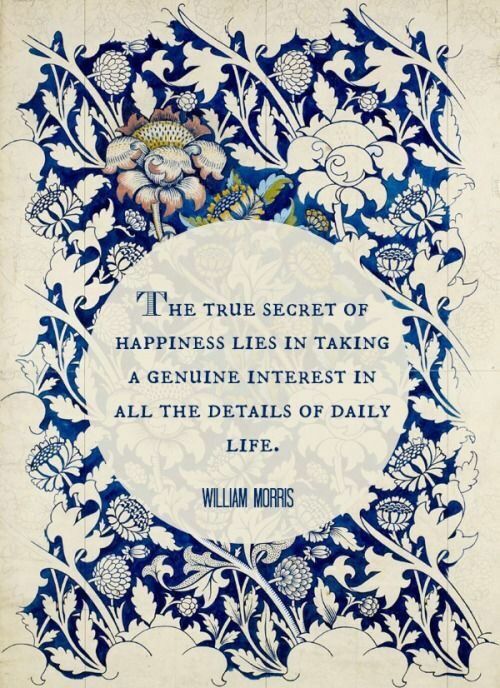 ~ William Morris was included in an 1873 book of cartoons of leading 19th-century figures. You can see the cartoon here. ~ The society was so saddened to hear of the passing of former president and long-time member Jean Johnson on May 27, at the age of 90. Read this lovely tribute here on OCAD's site. A very moving funeral service was attended by many members. It was lovely to spend time with them all after, and with Jean's many friends and her delightful daughter Anne. There will be a celebration of Jean's life at a future time. ~ A lot of our members will have attended Elaine Waisglass's photography exhibition at First Canadian Place, either at the opening (May 7, which four of the usual suspects attended and are photographed above), or at a special viewing on Saturday May 24, when Elaine also graciously hosted a wonderful garden party at her home. Members were able to revel in the beautiful plants that feature so strikingly in Elaine's photographs. You can see some of those photographs by visiting Elaine's website here. 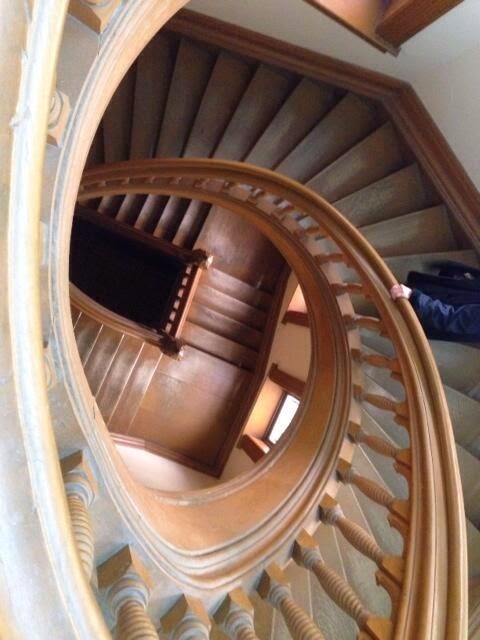 ~ On May 26 we attended an excellent architectural tour of University College led by Sharon Vattay. Thanks to Susan Pekilis for the photograph! ~ We were all holding our breath in horror when news of the terrible fire at Glasgow School of Art broke out. This amazing Rennie Mackintosh-designed building sustained damage, particularly to the library, but much was saved and efforts are underway to restore this architectural gem, which has meant so much to generations of artists, students and visitors. ~ You may have heard of the Delaware Art Museum's decision to sell some of their art to pay off construction debts and to replenish their endowment. The news that Holman Hunt's Isabella and the Pot of Basil was to be sold had art lovers around the world reeling. Today the painting was sold as part of a larger group at Christies. Today, on the Christies website, the result was described thusly: The [catalogue] cover lot, Isabella and the Pot of Basil, a masterpiece by Holman Hunt, sold for £2,882,500, a record for the artist at auction, surpassing the previous record of £1.8 million set in 1994. Unfortunately this comes quite a bit lower than expected and Pre-Raphaelite fans around the world will wait in dread to see what lot goes up for sale next. The Delaware Art Museum, a favourite on WMSC tours, houses the largest collection of Pre-Raphaelite art in North America. Cake and Croquet at Kelmscott... Count me in! 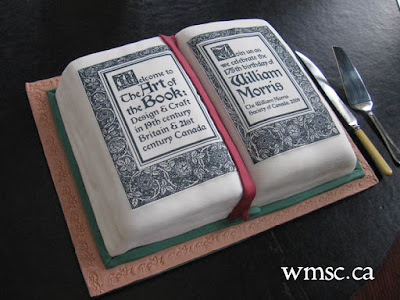 Not only is Kelmscott Manor newly offering croquet games on their grounds (apparently a favourite Morris family activity), but they've also done something very cool with cake! "For her Morris fruitcake recipe, Ursula [Evans] follows the original recipe, soaking the vine fruits in brandy, then baking slowly in her Aga before adding a luxury glacé fruit topping. As for the ginger cake, made with golden syrup, Demerara sugar, stem ginger and ground almonds, William Morris noted that it will ‘keep for six months in a tin’, but samples served at a recent tasting disappeared in seconds. ‘Very moist, well risen with a deliciously warm ginger taste’, commented Rob Rees, the Cotswolds Chef, who has been advising Kelmscott Manor on what to do with the newly discovered Morris family recipes. 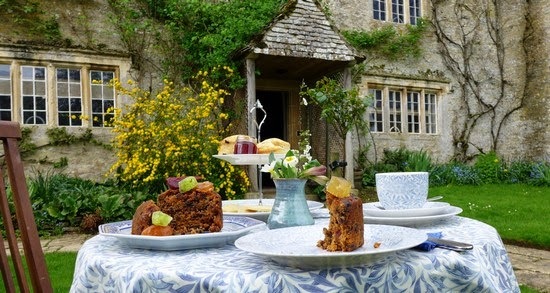 The cakes will go on sale at Kelmscott Manor from the Easter weekend (19 April), with the proceeds going to support conservation work at the Manor. Sarah Parker, Kelmscott’s Property Manager, says: ‘Morris was all about authenticity and honest craftsmanship; we believe these delicious cakes are part of that legacy.'" What's up on Twitter? Read on! ~ The William Morris Gallery is looking for artists to exhibit who are inspired by Morris. Check it out here. ~ More news on the Pre-Raphaelite's Society new London and the South group, with plans for pub nights, book clubs and other activities. We like the sound of that. ~ What we didn't like was hearing about the defacing of some of the PRB paintings at Delaware Art Museum. Apparently the stickers are not too hard to remove. Still... ugh. ~ This Sotheby's blog post references the Met's coming Pre-Raphaelite exhibition in this piece about the auction of Rossetti's Pandora. There's a lot of anticipation around this sale, with current estimates that it will take 4 million pounds. ~ And finally... University of Maryland's Special Collections "How we Might Live" exhibit marked Earth Day by linking to this beautiful Morris-penned poem, Earth the Healer, Earth the Keeper. Indeed! What! are we not glad-hearted? Is there no deed to do? And deal out due award. The night of prayer refused. Born from the hell of thought? To face its friendless care? The tangling of the net. Love went; and left no shame. The harvest of the blind? Hast thou slain love with sorrow? Have thy tears quenched the sun? Shall many a deed be done. And the story of thy lack? Earth shall not leave behind. For the day when this is old. That thou to-day shalt find. That they were born to die. Through the daylight and the mirth! Whoso may dwell on earth. ~ The William Morris Gallery has a LOT going on. Check out their activities right here. ~ Liberty and Co. have partnered with Nike to produce some very attractive athletic shoes and clothing, featuring Liberty prints, including William Morris's Willow pattern. Gorgeous! 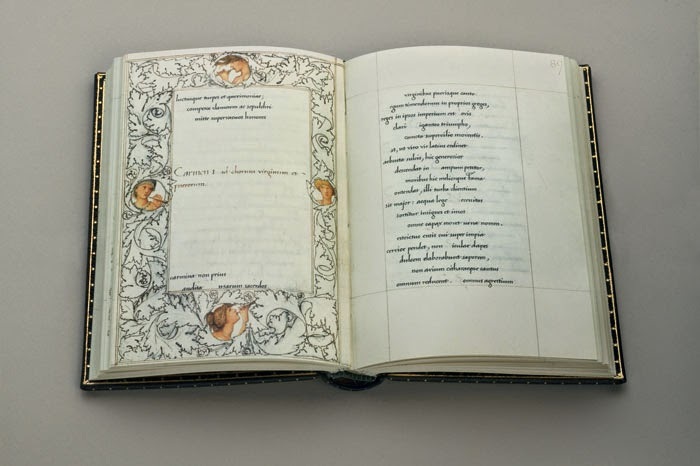 ~ Here's a feature on the University of Delaware's Special Collections site, about Edward Burne-Jones' stunning Flower Book. Their copy is a loan from the Mark Samuels Lasner Collection. ~ We started following the Ruskin Literary and Debating Society! They're welcoming Lucinda Hawksley on May 12 at 7 p.m. to talk on Ruskin, Dickens and the Pre-Raphaelites... In CASE you're in the area! ~ Red House was recently presented with the original building contract for Red House, and they tweeted some great pictures here. (Click on each of the four images to see them expand). ~ And the Association of Art Historians held their 40th Anniversary Conference and Book Fair. From all the tweets, it sounded like a very stimulating time! 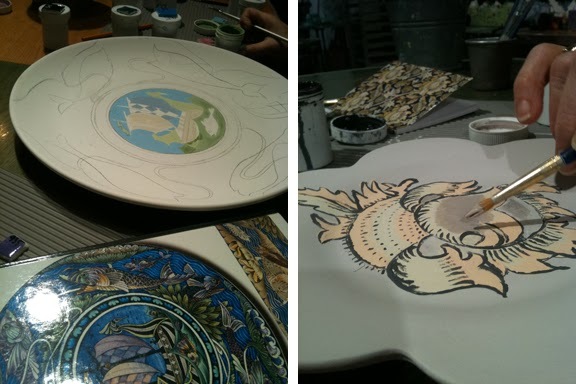 ~ This week the ROM's symposium for their "Around 1914: Design in a New Age" exhibit takes place. Are you going? Wish I was! ~ On the night of the 1861 census, here's the list of people residing at Red House, including house guest Algernon Swinburne. Check out how young they all were! ~ The new show by WMSC member Elaine Waisglass opened at the Roberts Gallery and runs til April 25. Click here for an article in the Toronto Star about Elaine's inspirations. ~ More here on University of College London's Publishing Project, in which students work "with the William Morris Society. Together they will produce a physical publication that highlights some aspects of the Society’s collections and history – focussing in particular on Morris’s belief in books as objects of beauty. Students will receive training in key production skills by staff at UCL, and in object handling, selecting and curating content, with support and expertise from the staff at the Society. It is hoped that this partnership will result in a product for the Society’s use and dissemination, as well as giving the students an amazing opportunity to engage with one of the most important aesthetic movements of book production there has ever been – the works of Morris and the Kelmscott Press." ~ @nouveaudigital suggests helping to spread the word on your favourite museums or galleries that feature Pre-Raphaelite works by placing a review on Trip Advisor. Check one out here! ~ Birmingham Museums and Art Gallery is featuring the OTHER Pre-Raphaelite stunners, in an exhibition on how the Pre-Raphaelites treated the male form. ~ You can explore Ruskin's drawing techniques as the Watts Gallery is hosting a Ruskin Techniques Workshop on April 26. That's it for now! Feel free to send in news and other items of interest by e-mailing us. Another great William Morris Birthday Symposium has come and gone. On Saturday, March 22, sixty members came out to University College on the University of Toronto campus and enjoyed an excellently programmed event, all in honour of the man himself, William Morris, on his 180th birthday. Five lecturers - Florence Boos, Veronica Alfano, Letitia Henville, Victor Shea and Christine Bolus-Reichert - made us think, wonder and question. Bill Whitla provided an illustrated treat (regarding The Water of the Wondrous Isles). Congratulations to the WMSC board and the program committee for all their hard work. And... in exciting news, just before the afternoon session began, members heard from David Lillico on the initial plans for our trip to California next year. I don't think some of us can bear to wait, but we'll have to! The dates are roughly mid-April to early May, 2015. A reminder that WMSC members will get priority to sign up (click on "Become a Member" if you'd like to join us). WMSC trips (which have included Iceland, Britain, France and the U.S.) are always excellent, and always fill up quickly. And... of course, to end the day in tribute to Morris, Florence Boos gave a lovely toast and cut the cake. This year's offering was based on Strawberry Thief, and the flavour was chocolate. 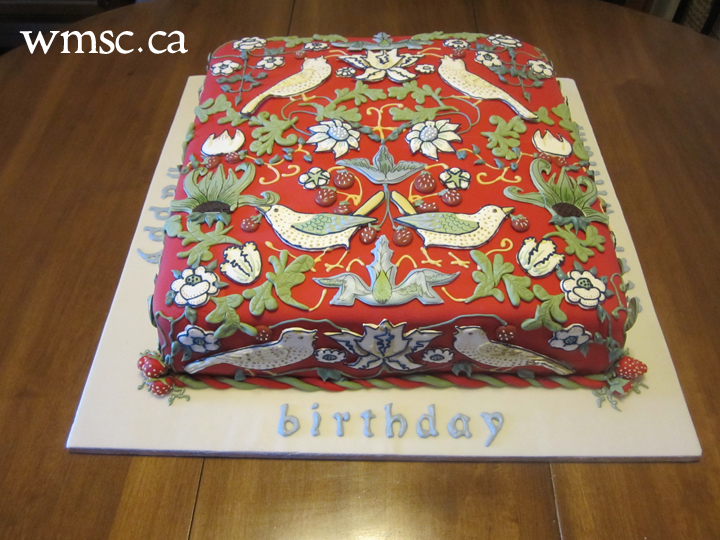 Thanks to member Lera Kotsyuba for tweeting pics of the cake! 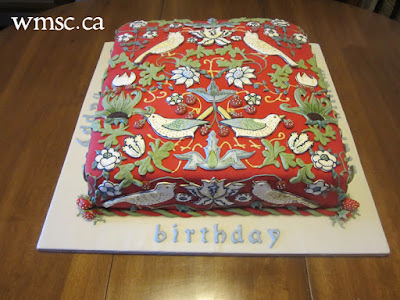 For those of you interested in the cake-making process, visit this blog to read about how the cake was made. "An alternative dining experience that brings William Morris' ideas of fellowship to life. Enjoy great British food, carefully selected craft beers and excellent company in a communal atmosphere. Say hello, find common ground and tuck in." ~ There's lots of excitement around the excellent John Ruskin exhibit at the National Gallery in Ottawa. Thanks for the heads up, WMSC member Lera Kotsyuba. Who's going? ~ Toronto is busting with great art shows to explore. Here are some. ~ In 1859, the Hogarth Club boasted some intriguing members! ~ One of our favourite bloggers, Kirsty Stonell Walker is giving a talk on Alexa Wilding in May in Bournemouth, in case you're in the area. ~ @WMorrisArtistry is digitizing the Kelmscott Press archives for a forthcoming book! ~ If you feel like adding something very special to your home, check out Project31, an auction of faculty art in support of OCAD students. ~ If you're in Connecticut, the Connecticut Repertory Theater is premiering a puppet stage version of Christina Rossetti's sensual and eerie poem Goblin Market. you can read more here. ~ The quote of the day has to be this one, by Morris: "Last night I dreamed I had to draw a sausage; somehow I had to eat it first, which made me anxious about my digestion." ~ And, from Ayla Lepine (teaches art history at U of Nottingham) of @heartchitecture, here's a Sunday smile: "art historians curating loo graffiti"
We hope to see you at next week's symposium, Saturday, March 22! If the great line up of speakers and topics wasn't enough to get you excited about attending this year's symposium, here's another reason: cake. Check out our CAKES tab above for a full reportage on WMSC cakes since 2002! In preparation for our March 22 symposium, Morris and History: historical transformations in William Morris's poetry, prose and design, meet the last of our five speakers, Christine Bolus-Reichert. 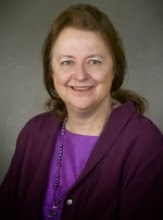 Christine Bolus-Reichert teaches a variety of courses in nineteenth-century British literature and intellectual history. While earning her Ph.D. in English and Comparative Literature at Indiana University, she worked for two years as the book review editor of Victorian Studies and currently maintains her relationship with this flagship journal as reviewer and bibliographer. She cares deeply about and writes on issues of aesthetics in everyday life; her articles have appeared in Romanticism, Nineteenth Century Prose, Studies in the Novel, and ELT: English Literature in Transition, 1880-1920. Her book, The Age of Eclecticism: Literature and Culture in Britain, 1815-1885, was published in 2009 by the Ohio State University Press. She is currently writing about the relationship between romance and aestheticism in the 1890s, and the persistence of the forms of Victorian romance in the twentieth century and after. Christine talk will end the main part of the day, and her topic is Romance and History in The Water of the Wondrous Isles. In preparation for our March 22 symposium, Morris and History: historical transformations in William Morris's poetry, prose and design, meet the fourth of our five speakers, Victor Shea. Victor Shea is an Associate Professor of English and Humanities at York University in Toronto, Canada. He has published in the field of Victorian literature, particularly on imperialism, popular culture, children’s literature, and political history. Specifically he has written on Stevenson, Haggard, Kipling, J. R. Seeley, William Morris, and James A. H. Murray and such topics as adventure fiction, penny dreadfuls, and Victorian philology. With William Whitla he has jointly published three books and several articles, including Essays and Reviews: The 1860 Text and Its Reading (Charlottesville: University Press of Virginia, 2000. [Victorian Literature and CultureSeries]), Foundations: Critical Thinking, Reading, and Writing (Toronto: Prentice-Hall, 2nd ed. 2004, Victorian Literature: An Anthology (Oxford: Wiley/Blackwells, Forthcoming, Spring, 2014). Victor's talk for the WMSC will be titled The Dealings of Civilization (or organized misery) with ‘Non-civilization’: Anti-Imperialism and Utopian Thought in William Morris’s News from Nowhere. In preparation for our March 22 symposium, Morris and History: historical transformations in William Morris's poetry, prose and design, meet the second of our five speakers, Veronica Alfano. Veronica Alfano is a Faculty Fellow at the University of Oregon. 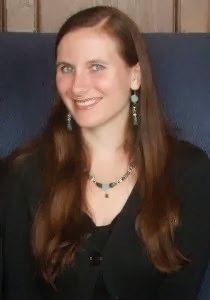 Her research interests include Victorian poetry, lyric theory, gender studies, and photography; her articles have appeared in publications such as Feminist Studies in English Literature, Baylor Journal of Theatre and Performance, Critical Matrix, and Victorians: A Journal of Culture and Literature. 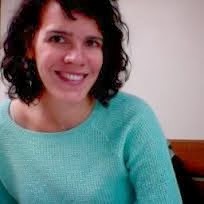 Currently, she is co-editing an essay collection called Virtual Victorians: Networks, Connections, Technologies and working on a book project titled The Lyric in Victorian Memory, which explores the links between mnemonic form and cultural nostalgia. 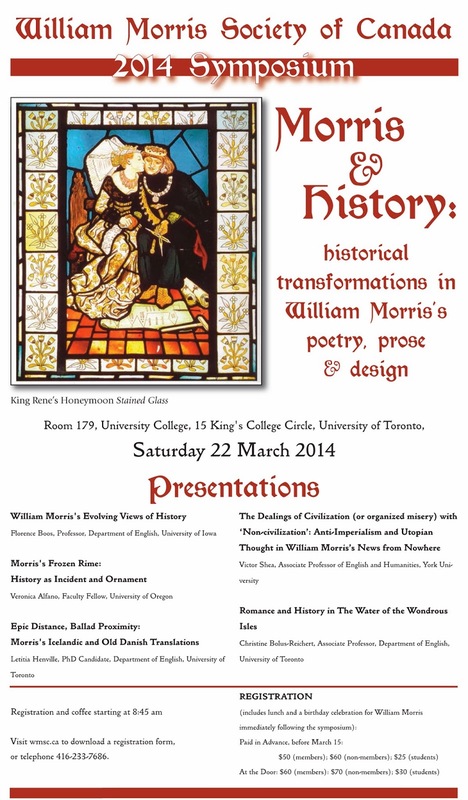 Veronica's talk for the WMSC is title Morris's Frozen Rime: History as Incident and Ornament. We are so looking forward to welcoming her to Toronto! In preparation for our March 22 symposium, Morris and History: historical transformations in William Morris's poetry, prose and design, meet the first of our five speakers, Florence S. Boos. Florence S. Boos teaches Victorian poetry, nonfiction prose, and cultural studies at Iowa. Her teaching and research interests include poetry by women, working-class literature, Pre-Raphaelite art and literature, the life and work of William Morris, and nineteenth-century social, political and intellectual history, as well as Marxist and feminist approaches to nineteenth- and early twentieth-century literature. The general editor of the Morris Online Edition, she has published critical works on the poetry of Dante Gabriel Rossetti and William Morris; annotated critical editions of Morris’s The Earthly Paradise, The Socialist Diary, and The Life and Death of Jason; and more than a hundred and fifty articles, essays, introductions, and reviews. Her annotated anthology Working-Class Women Poets of Victorian Britain, a first attempt to identify the scope of these women’s lives and works, appeared in 2008, and her ‘Love and Work Enough’: The Early Writings of William Morris, is forthcoming in 2014. She is currently writing a book on memoirs by Victorian working-class women. A former president of the Midwest Victorian Studies Association and the William Morris Society in the United States, she also serves on the advisory boards of Victorian Poetry, The Journal of William Morris Studies, The Journal of Pre-Raphaelite Studies, Cahiers Victoriens et Edwardiens, and the Archive of Working-Class Literature. ~ undergraduate courses in (e.g.) Victorian Poetry and Fiction, Critical Theory, Literature of the American Midwest; African-American Literature, ‘Green’ Traditions in British and American Literature, and The Literature and Culture of Scotland. She has also gathered together several generations of graduate students in reading groups to help prepare for their comprehensive examinations in Victorian literature, and has directed more than fifty dissertations. Her former students now teach at a wide range of institutions in several countries. She has maintained ties with Iowa’s Women’s Studies Program, of which she was a founding member, and has served from time to time on university-wide committees which examined problems of inclusion as well as student and faculty welfare. The WMSC is very much looking forward to welcoming Florence on March 22, when she'll present her intriguingly title talk, William Morris's Evolving Views of History. The Gardiner Museum (@gardinermuseum, left) here in Toronto celebrated its 30th birthday this week by opening its doors for free and hosting a pile of interesting events. This exquisite, boutique museum, dedicated to ceramics, is a must-see for locals and visitors alike. The Gardiner is also presenting the exhibition, Ron Thom and the Allied Arts. Ron Thom was one of Canada's greatest architects. 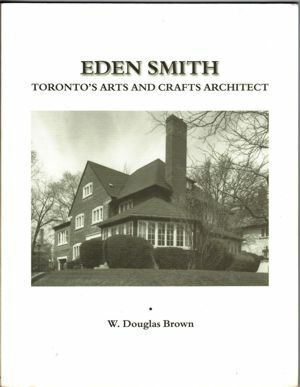 WMSC members might remember a very fine lecture on his work a few years ago, and a tour of Massey College, which he designed with strong Arts and Crafts influences. 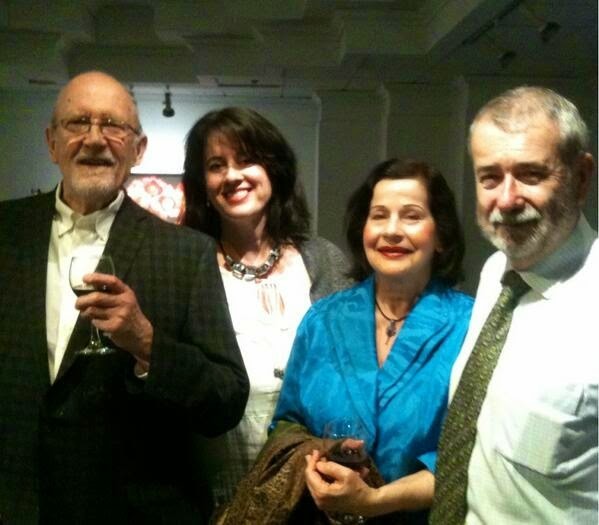 The Gardiner's exhibition is open now and runs til April 27. ~ The ROM (Royal Ontario Museum) has announced Around 1914: Design in a New Age. From March 29 of this year until March 21, 2015, this original exhibit showcases the ROM’s decorative arts collections including works by Jensen, Tiffany, Lloyd Wright, Bugatti, Knox, Dresser and Hoffmann. There will also be a Decorative Arts Symposium, April 10 and 11, which looks unmissable. Check it out here. ~ Just in case you're in the area of Ann Arbor, Michigan, Motawi Tileworks is conducting a tour on March 29. They'll visit tile installations in and around Ann Arbor including the home of owner Nawal Motawi. Here's a sample of what you'll see! ~ Thank you to WMSC member and tweeter @LeraKotsyuba for pointing us to this exciting bit of news of recently discovered Pre-Raphaelite-inspired artwork. ~ The Guardian reported that in May, Sotheby's will be auctioning Rossetti's painting Pandora, 1871 (for which Jane Morris was the model). It is predicted that it will break previous sales records for a Rossetti work. ~ Our friends at the William Morris Society (U.S.) tweeted that Arts and Crafts Tours is leading a three-day architectural exploration of Chicago. This tour was requested by The Stickley Museum at Craftsman Farms for their members. WMSC members will remember our own fantastic tour there in 2008. There are some elements that we didn't cover and, anyway, it's never too early to revisit some of these remarkable sites. ~ This week, in celebration of World Book Day (and in preparation for this year's William Morris birthday cake) we tweeted this picture of our Art of the Book cake for our symposium a few years ago. Watch this space for a retrospective of past cakes and a reportage of this year's cake! Have you signed up for our full-day symposium on March 22? Space is limited... and there'll be lunch and, after the afternoon sesssion, a toast with a very special cake for those attending. More on the cake in a later post, but in the meantime, check out our future events to read why you need to attend this event. This week we were so excited to read that the Metropolitan Museum of Art in New York is mounting an exhibit, The Pre-Raphaelite Legacy: British Art and Design from the Metropolitan's Collection. This runs from May 20 to October 26 of this year. "Some thirty works from across the Museum's collections - including paintings, drawings, furniture, textiles, prints, and illustrated books, many of them rarely on view and united for the first time - will demonstrate the enduring impact of Pre-Raphaelite ideals as they were adapted by different artists and developed across a range of media. At a time of renewed appreciation for art of the Victorian age, the installation will direct fresh attention toward the Metropolitan's little-known holdings in this important area." The exhibition is made possible by the Lillian Goldman Charitable Trust. An adjunct exhibit will be William Morris: Textiles and Wallpaper, from February 3 to July 20. ~ As Toronto emerges from another polar vortex, and more snow falls, it's nice to know spring is happening somewhere! Click here for a lovely picture of the daffodils emerging at Red House. And click here to see the front door of Red House, through which visitors are now entering, something they haven't been able to do for ten years! ~ The British Council hosted a "Twitter Tour" of the Jeremy Deller exhibit, English Magic at the William Morris Gallery. You can experience it after the fact, right here. ~ Get a fashion/Morris fix right here, in a delicious video for a past exhibit at the V&A, The Cult of Beauty. ~ And, for an "awww" moment, here's a beautiful red setter, laying on his colour co-ordinated chair. Re-discovered after many years, our current exhibition is of 10 previously unknown and unseen beautiful drawings for embroidery designs from Morris and Co. The drawings were originally discovered in an attic room of Kelmscott House, Hammersmith and then disappeared before being brought back to the William Morris Society premises in the coach house of Kelmscott House This exhibition allows us an opportunity to have another fresh glimpse at the prolific creativity of Morris and his fellow designers whilst further research is currently underway to identify the pieces breathing new life into these newly re-discovered gems. ~ Kelmscott Manor has a very active YouTube channel! So much to see... check it out here. ~ The William Morris Gallery updated their "What's On" page on their website. ~ Red House is justly proud of their newly acquired Philip Webb water jug and tweeted a picture of it. They're also repainting (by brush) rooms so that they appear as they would have in Morris's time. Out with the white, in with the mustard! "No man is good enough to be another's master." Diane Waggoner from the National Gallery of Art in Washington, DC, visited the WMSC last Wednesday to give a lecture, Photography and Pre-Raphaelitism. Gorgeously illustrated, it provided fascinating links between the early days of photography and the PRB. There was a good crowd in room 179 at University College and later they enjoyed refreshments in the lovely Croft Chapter House. Pictured left are Diane and WMSC president Susan Pekilis. We'll be back at this favourite venue for our day-long symposium in March. Have you registered? ~ At the National Gallery of Art in Ottawa, an exhibition opened titled John Ruskin, Artist and Observer. It runs until May 11. ~ The always-interesting Tony Pinkney blogged about Capitalism and Climate Chaos. Here's the link to his blog. 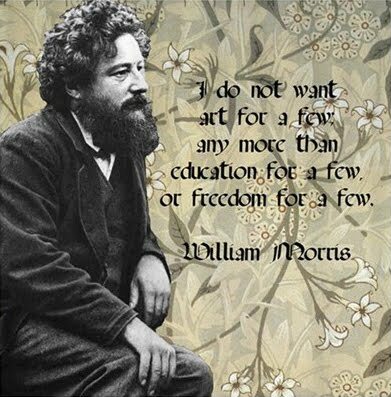 ~ William Morris's birthday was March 24, and it is celebrated annually by his admirers. While we at the WMSC will be celebrating here in Canada on March 22, the UK Society is hosting a fascinating talk given by Jan Marsh and Frank Sharp on recently discovered letters from Jane Morris "which radically revise the popular view of a silent, discontented invalid and reveal the range of her interests and opinions." Can't wait to hear more! ~ And check this out! 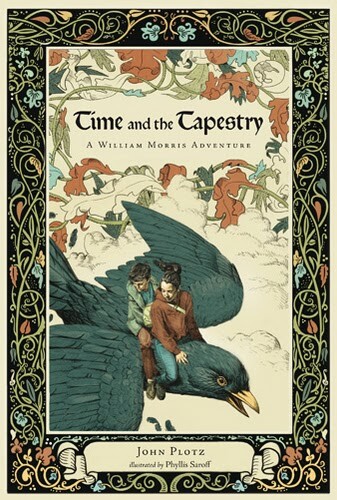 An advetnure for children, but I`m sure many adults will be compelled to read it: Time and Tapestry, a William Morris Adventure. Are you coming to this week's WMSC lecture? ~ Jeremy Deller, who's English Magic show is on at the William Morris Gallery, is interiewed here about Morris and his socialism - a must read! ~ Only a week now to catch the National Gallery's Artists, Architects and Artisans exhibition, that members of our society visited last year. Here's a video featuring curator Charles Hill. ~ The Watts Gallery's exhibition, John Ruskin: Photographer and Draughtsman includes Ruskin's use of photography, which should provide an interesting link to our event next week, Photography and Pre-Raphaelitism. Here's a video. ~ You can help Kelmscott Manor be voted as the UK's " most inspiring museum or heritage visitor attraction." The nomination form is here. Check out the exciting details of our 2014 symposium on our Future Events page. In the meantime, you can also download our poster. Please forward it to your friends, distribute and post it early and often! And don't forget to register! ~ Kelmscott Manor is launching an Artist or Craft-maker in Residence. The Residency embodies the influence Kelmscott had on Morris and his associates, and reflects its relevance to a modern audience. The William Morris Gallery won the public voting stage of Connect10, a competition that teams up winning venues with 10 artists to run an event during Museums at Night. 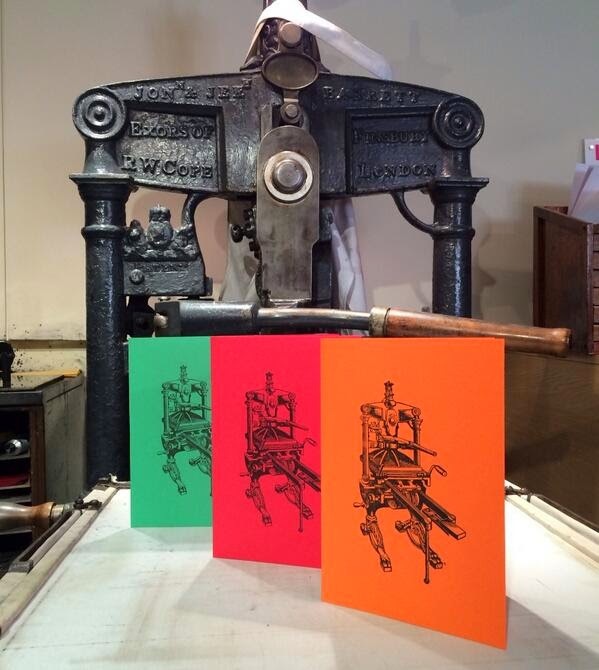 Kelvyn Smith, AKA Mr. Smith and his Letter Press Workshop will be appearing at the Gallery over the weekend of Thursday, May 15 to Saturday, May 17. Under Mr Smith’s expert guidance gallery visitors will use traditional type to create personal and political slogans that mean something to them. To set the mood they'll start the evening with a dramatic performance of one of Morris’s socialist chants. Keep checking the gallery's website for more details. 1. 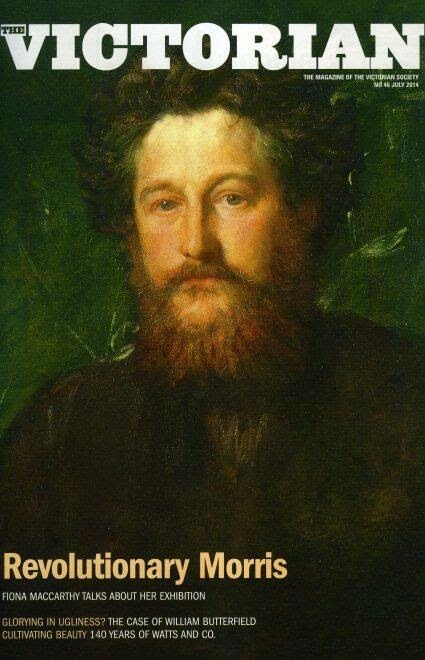 Papers are sought for a session co-sponsored by the William Morris Society and the Old Norse Discussion Group on any aspect of William Morris and his associates in relation to Old Norse topics: literary, linguistic, artistic, biographical or political, ranging from pre-historic origins to the present day. Please send abstracts and C.V. by March 15, 2014 to bryane@mst.edu and florence-boos@uiowa.edu. 2. "The Pre-Raphaelites: The Ecological and the Oceanic" The William Morris Society will also sponsor a panel on "The Pre-Raphaelites: The Ecological and the Oceanic." 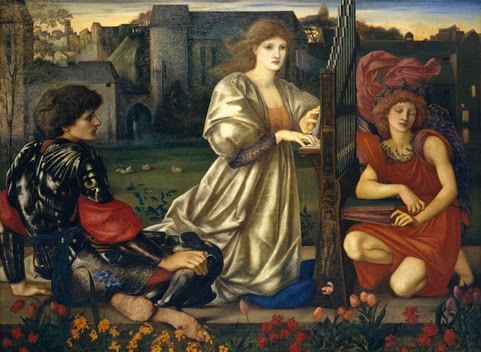 For this we seek papers on the Pre-Raphaelites, Morris and ecological concerns, the environment, ‘green’ politics, and/or oceanic journeys, Morris’s influence in Asia and Oceania, or trans-Pacific approaches to Pre-Raphaelite studies. Please send abstracts for proposals by March 15, 2014 to florence-boos@uiowa.edu. Today is the 100th anniversary of Jane Morris's death. There have been lectures, portrait exhibitions and the internet is a-buzz with tributes to the remarkable stunner, muse, wife, mother and lover. On this day in London, Peter Faulkner is giving a talk on Jane at the William Morris Gallery in London. The gallery is also looking for more volunteers to help them out in their many wonderful activities; they're holding open days on January 31 and February 1. 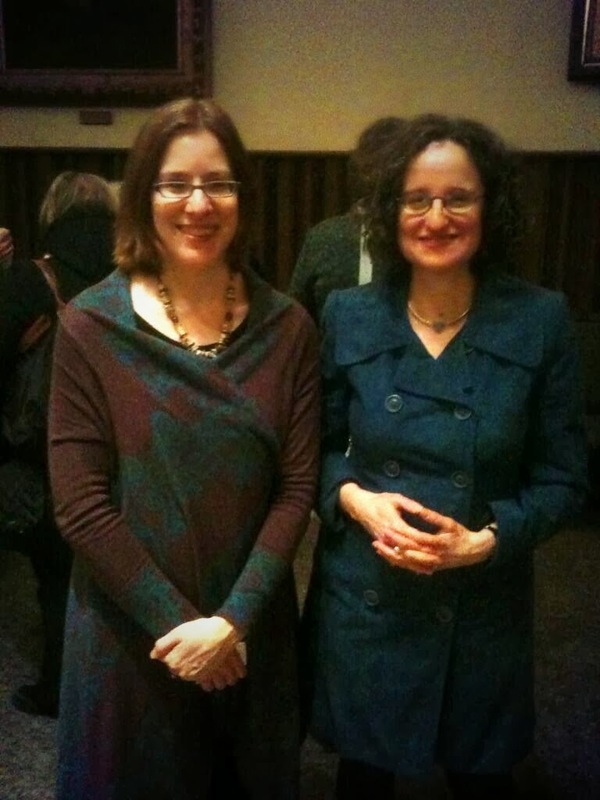 Last Thursday Jan Marsh also gave a talk on Jane Morris at the National Portrait gallery. Their display, Janey Morris: Pre-Raphaelite Muse, continues until May 11... in case you happen to find yourself in London! ... and you can enjoy Jane, along with Rossetti, fighing aliens in a graphic novel. Finally! Find out more here. ~ The William Morris Society (UK) is looking for a project manager. It sounds intriguing. Read more here. ~ Jeremy Deller's Morris-inspired English Magic exhibition comes to the William Morris Gallery until March 30, after which it travels to Bristol and Margate. Watch this video on BBC for more. ~ And, a final Jane Morris tribute, a poem by Sarah Doyle, inspired by Morris's claim that he couldn't paint her, but he loved her. You can keep up to date on what's happening out there by following us on Twitter. Or just check back in here! Click on our Future Events page to learn more about the next two events for Winter 2014. First, on February 12, Diane Waggoner (National Gallery of Art, Washington, DC) will give a lecture on Photography and Pre-Raphaelitism. Then, on March 22, it's time for our annual Morris birthday celebration, which will follow a fascinating day-long symposium: Morris and History: historical transformations in William Morris's poetry, prose and design. Several WMSC members gathered last Wednesday evening at the Clay Room on the Danforth to let the Morris inspiration flow! From what I've seen done in the past, the final pieces will be stunning. Hands-on events like this are always great fun. Note that the pictures on the left illustrate unfinished pieces. And when they're glazed and fired, they're transformed. I hope the artists will not be too modest and that they'll send in their finished works for us to see! ~ Standen House is in the midst of redecorating their drawing room. What an impressive process! Check it out here. ~ Hornbake Library (University of Maryland) tweeted a picture of a postcard from William Morris expressing satisfaction for the binding of a book. ~ One of our favourite blogs, the Pre-Raphaelite Sisterhood, posted an archive of #WombatFriday happenings for 2013. No, you're not dreaming. For an explanation and lots of lovely pictures, visit this link. ~ Cartwright Hall Art Gallery (Bradford, UK) is mounting a Rossetti exhibition on portraits of Jane Morris. More details here. ~ Read the thrilling details of how priceless furniture at Kelmscott Manor was saved from recent flooding in the UK. ~ Check out all the great stuff happening at the William Morris Gallery! ~ The Tea Room of the William Morris Gallery features the regular Long Table, a fine opportunity for fine conversation and fellowship. Morris would have loved this! Watch this blog for next week's round up! Thanks to all the great tweeters, especially @KelmscottManor, @WMGallery and the amazing Dr. Dinah Roe at @preraphsrule.